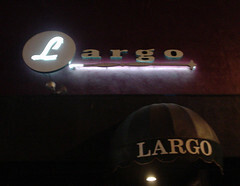 I saw the world premiere of the documentary Largo this past Sunday night at the L.A. Film Festival. It was really enjoyable for me, as one of the people who loved the club's original incarnation on Fairfax. Also, I'm a fan of many of the musicians and comedians who performed there. The film is black and white and performance based. There is no narrative and minimal subtitling. Featured performers include Grant-Lee Phillips, Aimee Mann, Michael Penn, Andrew Bird, Colin Hay, Jon Brion, Davíd Garza, Tom Brousseau, Sarah Silverman, Greg Proops, Zach Galifinakis, Louis CK, John C. Reilly, Bic Runga, Flight of the Conchords (how did I miss that?!? ), Nickel Creek, Jackson Brown and a couple of others I'm sure I'm forgetting. It actually made me quite sad knowing I can't ever go back there for such an intimate show. I haven't been to Largo 2.0 at the Coronet Theatre yet, but hope to check it out soon. Have you? Aww, it's always sad when something comes to an end. I hope the new one is as good for you all.